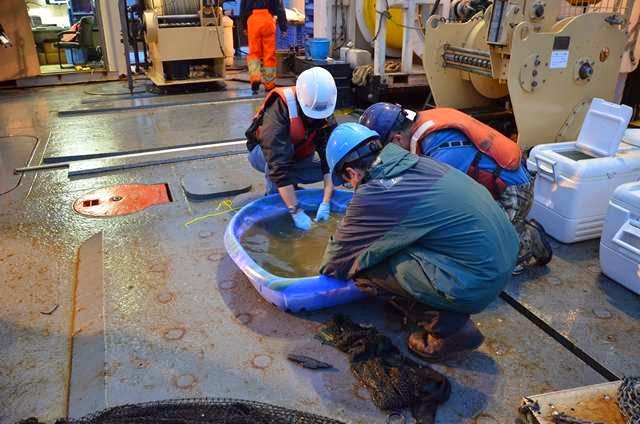 Part of our ongoing ecological research on the impacts of oxygen loss on marine biodiversity is to determine low oxygen thresholds for animals living in hypoxic environments on Canada’s Pacific Coast. From years of surveying the life living around the Ocean Networks Canada instrumentation in Saanich Inlet, we have identified the slender sole (Lyopsetta exilis) as one of the key indicator species that drives assembly patterns for communities living in hypoxia. In order to measure hypoxia thresholds, we need to capture the fish with a trawl, keep them alive, and then measure physiological parameters such as metabolic rates and critical oxygen tensions under lab-controlled conditions. A Benthic Transect Across Hypoxia from Jackson Chu on Vimeo. Although our primary focus is on the community response to oxygen loss in the oceans, the slender sole is also a very unique species. Almost no research has been done on this flatfish — it's a small flatfish, not commercially important, yet super common in the Salish Sea and on the continental shelf from Alaska to California. The fascinating thing about slender sole is that it can live in almost zero oxygen and can tolerate hydrogen sulfide (H2S - toxic to most life), making it a complete oddball in the world of fish. You would never have known they were so adapted to extreme conditions unless you went looking for them using an ROV like Oceanic Explorer or Ocean Networks Canada underwater camera footage, and saw them burying themselves in H2S bacterial mats. 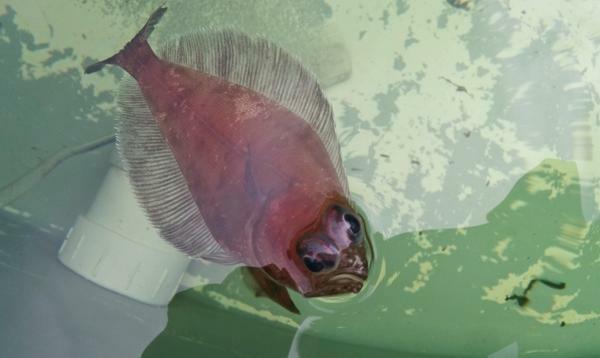 We hope to capture more of these fish in the near future, as we’ve already piqued the interest of several research groups who are curious to figure out more about their weird physiology. A slender sole (Lyopsetta exilis) captured from this week's trawl. 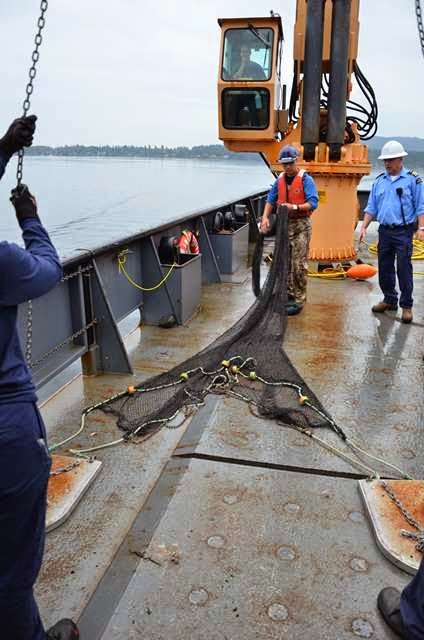 aboard CCGS John P. Tully setting the fish trawl. The small batch of fish from this week’s trawl is currently alive and happily living in the Aquatics Unit at the University of Victoria. This small cohort (n=39!) will be just enough to get our lab experiments started. When we match these lab-data to our field surveys, these measurements will tell us ‘how close to the edge’ animals can live under severe hypoxia. and Fabio De Leo (ONC) hand sorting slender sole into coolers for transport to UVic. Follow Jackson on Twitter at @jwfchu.